I use this sweeper everyday. So easy for cleanups. So handy.I looked all over for one, as my mother had one that we used all the time. I finally found it and couldn't wait to get it. Works awesome! To sweep my carpet upstairs. Very handy. I use the sweeper to clean my carpet. It works very well... No noise either. The kids thinks it's great as well. I have dogs in the home. This sweeper is the only thing I have found that removes the dog hair completely. It is small and lightweight. Much easier to use than a vacuum cleaner and does a far better job! Thanks Bissell! This is also a replacement for a 1970 model. The old one still works but I wanted a new one. I love it, it picks up good for the size. i use it for small jobs which is a big help, and Bissell has been around along time. We use the carpet sweeper in between our use of the big carpet sweeper. Picks ups all the dirt and pet hair from the indoor=outdoor carpet we have on our sunporch. I don't have to get out the big vacumn. 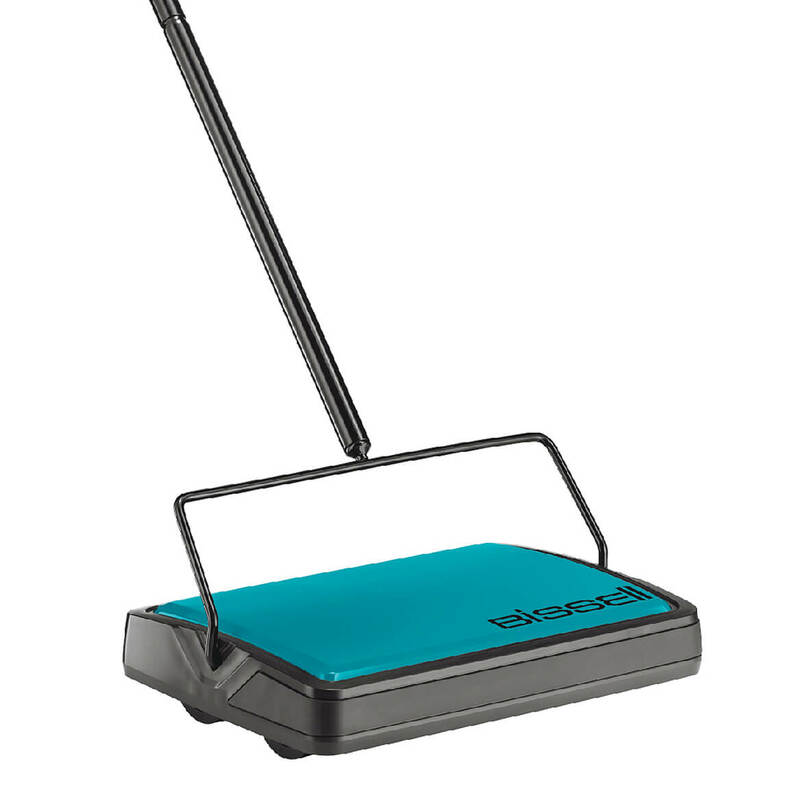 This carpet sweeper is light weight and so easy to use. I love it. This works great on Berber carpets and hard floors. I have dense pile carpet downstairs and find that while it works, the vacuum cleaner is better. I do like not having to get the vacuum cleaner out and toting it upstairs. I am happy with this purchase. Love it, didn't think an item this reasonable would be this GREAT!! I live in a small apartment and my vacuum does not fit under my furniture where there is a lot of dust and cat fur. The Bissell fits under there nicely. 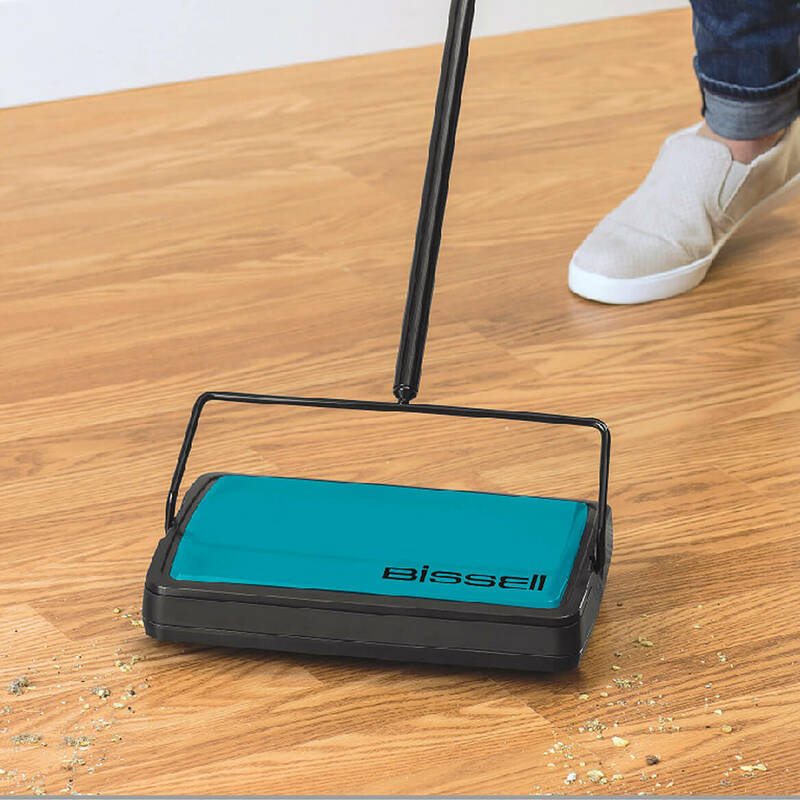 The Bissell Carpet Sweeper works great for little jobs. It's great for small jobs and picks up well. I took it to a retirement home that I work at and it saves a lot of time by not having to get out the vacuum and the residents don't like the vacuum going all the time because of the noise. I plan on buying one for my home because I tried it on my carpets which have a lot of pet hair and it works beautiful. so easy and efficent great product! I use my sweeper all the time. It picks up things that a regular vacuam doesn't. It is especially good at picking up both dog and cat fur. I have 6 cats and two dogs. I usually go through 1 vacuam a year. The sweeper is quiet and so easy to use. I love it so much that I am buying another for down stairs. My house is alway clean because the sweeper is handy and convenient. I use it on my hardwood floors and area rugs. When unexpected company is soon to arrive, I can get rid of crumbs, lint, and dust in minutes. I love that there is no cord involved. Best of all, I dump the debris collected after every use because it is so simple. I would not want to be without a Bissell carpet sweeper. I have back problems which makes it hard for me to vaccuum. I have a house keeper come once a week. 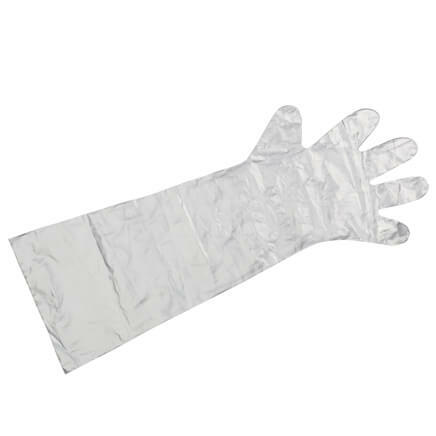 This is great and lightweight to use to pick up crumbs,and dog hair in between the housekeepers visits. The sweeper is great. I have 5 cats and every day I have to run the sweeper to pick up all the cat hair. This is great when I'm in a hurry and can't run the regular sweeper. Great Product. Only wish the handle was wider and more sturdy. Best sweeper on the market. I just got a new puppy and she loves to pull out the stuffing in her toys. Thanks to the Bissell carpet sweeper I don't have to pull out the old vaccumm. It's the best product ever. It reminds me so much of using my mother's and my grandmother's sweepers. At a time when technology is in everything and can be so complicated this is simple to use, reliable and really does the job. No cords, attachments than break down on it or to figure out. No complicated assembly or directions on how to use. I just love this little gadget and am thinking of ordering two more. One for my upstairs and one for the lake cottage. I gave two away to my college student grandkids. Love it!! I have had 4 electric sweepers which do not do nearly as well as this sweeper. I had a larger (much older) version of this sweeper years ago and was always sorry I got rid of it. Now I am glad to have this one. It is smaller, does a great job and gets under most of my furniture very well. And, it is quiet so my dog isn't afraid of it. I just wish the handle was a bit longer. it is great for those in-between vacuum days. I used it on the porch outdoor carpeting. It even picked up those little black lints in our bedroom from my husband's socks. This carpet sweeper is the best!!! I bought two, never have too many. I bought two carpet sweepers, one for my sewing room,to pick-up the threads and one to use at our cabin where there is no electricity. 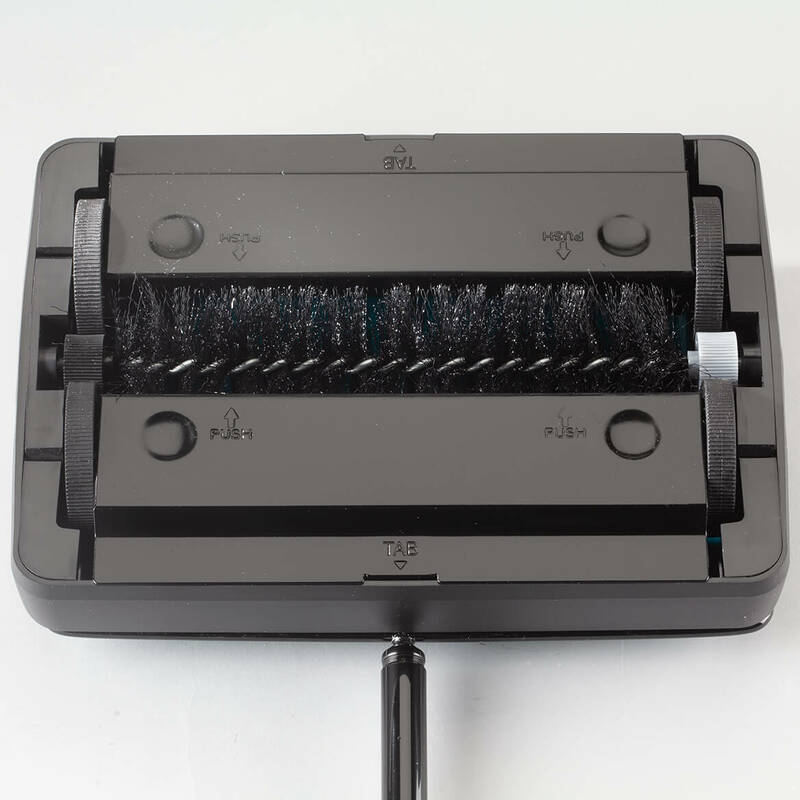 The best thing is the carpet sweeper is small and easy to handle and store. I haven't found and thing that I would make me unhappy about it. It works and it is quiet! Vacuum cleaners are really noisy. This is quiet and there is no cord to deal with. It really does work. I had one of these about 25 yrs ago, and if memory serves, I remember them being very solid pieces. This one, not so much. Sort of a lightweight metal and the brushes don't seem as sturdy as I recall, but I have to say that it still does the job it was intended to do. It's still good for a quick cleanup between vacuumings. My old one finally wore out. Great for quick clean ups. For my office to clean up little paper messes on the carpet. Tired of pulling out vacuum or electric broom each time. Hopefully this will be easier. I know back 30 plus years ago it was. Great for quick pickup. We'll see if it does all floors. Old fullerbrush did. Kitty litter pickup without dragging out a vacuum. 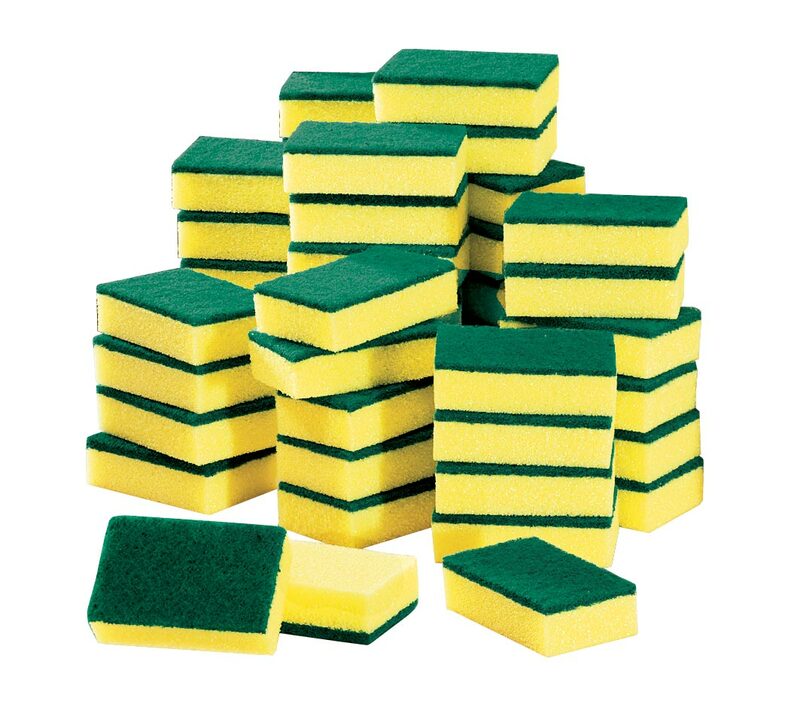 I have used one years ago and its so easy to clean up small messes and to do a daily sweeping of my floors. Because I use to use this a a young girl. I picked this sweeper as I don't always want to get out my vacuum cleaner to do spot cleaning; therefore, I felt this was a good item to buy. I always need a quick pick up! When I was young, my Mom had one just like it and I remember how simple it was to use and it did the trick. Great item and no loud noise. Doesn't get better than that. I need something to clean my carpet fast because my cat gets litter on my carpet frequently. This will be so much easier to clean it up!!!! Bissell products are good and last a long time. I can't wait to get it!!!! to replace an old one. All the customers had good things to say about this product. It's small and convenient. I have used one at church , worked well, and I think it will work on the artificia turfl on my deck. I used the same one at church and it worked like a corded vacuum. Thank you. Because I can't find it in any store and I love that you don't need to plug it in to use it. My Dyson vacumn cleaner does not fit under the bed. I need to clean rug because of dog; eats treats. I have been looking for one of these for a while now just so much easier using it than breaking out the dirt devil - I have outdoor carpeting and the carpet sweeper will be so much more convenient than other things I have used. For quick carpet cleanup that easily hides in my closet. To clean up small spills that our grandkids make when they are at our house. Great for quick clean ups on the rugs. I just wish it came with a comb to clean the brush with. Mostly because of the ease of purchase on the site. New business , good for quick clean ups!!! I love Bissel and had one yrs ago! Does an excellent job!!! Got one for my mom and she really loves it. So, got one for me and one for my brother. We have a very large house and basement. This will do the trick between regular cleaning. Just love it...always works well had them over the years. is the handle in one long piece? or does it come in sections? BEST ANSWER: Thank you for your question. This item's handle does come in sections that must be screwed into one another. We hope this information will be of help to you. BEST ANSWER: No, this sweeper does not have a battery but it cleans well on bare floors and short pile carpets. Not so well on a carpet with deeper pile. We have a cat and this does a good job on our floors to pick up her hair. No battery with this one it is the best little carpet sweeper for the shorter carpets in the kitchen and downstairs or even the deck, I love mine. Thank you for your question. It does not work by batteries. It works by pushing. We hope this information will be of help to you. No this Sweeper does not have batteries, I remember my Mother had this back in the 1960's and it works great. No. It's a manual push and I use it for indoor/outdoor type of carpeting & floors. BEST ANSWER: I have had these sweepers for many years and buy them as gifts all the time. I use them on high traffic areas and area rugs between regular vacuuming. They are GREAT for pet hair. Since I only have a wood floor in my kitchen, the only time I've used it there is to pick up dry dog food and larger clumps of debris. It doesn't scratch or harm the wood. Hope this helps. I don't have wood floors, but I do use it in my kitchen on linoleum and it works. When using it on carpet you don't have to press down to clean, but you do have to press down, just a little, on non carpet floors. Don't go too fast when vacuuming either because it will just move the debris around. Good for small clean ups. My kitchen is small. Hope this helps. No damage to my wood floor from use of this sweeper. to the contrary, I have one and gave one to my mother and both handles have been fine. No. Mine has never given me any trouble. The handle on mine is metal. How does it work on tile floors? BEST ANSWER: We mostly use the sweeper on an area rug, but it picks up dirt and dust quite well on hard wood floors too. Our sweeper has lasted a long time already and we're pleased. This works great on my area rug and on my floors. It seems to pick up very well. I am really pleased with it. Does anyone know how to replace the middle roller without breaking anything, it fell off/popped off? and no one in the house knows how that happened. BEST ANSWER: Thank you for your question. Unfortunately the roller cannot be replaced. We hope this information will be of help to you. Well you must know something that Bissell doesn't because they sell the replacement rollers, I contacted them and am waiting for their reply. 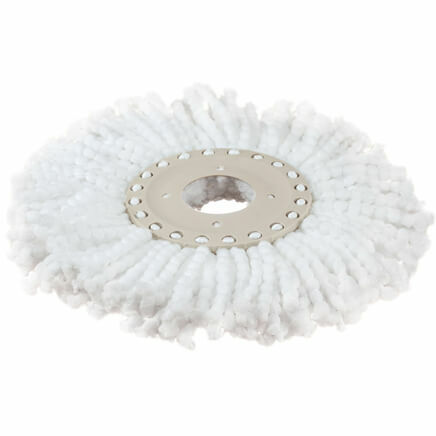 Clean spin 360 microfiber replacement mop head lets you keep your floors in sparkling condition. 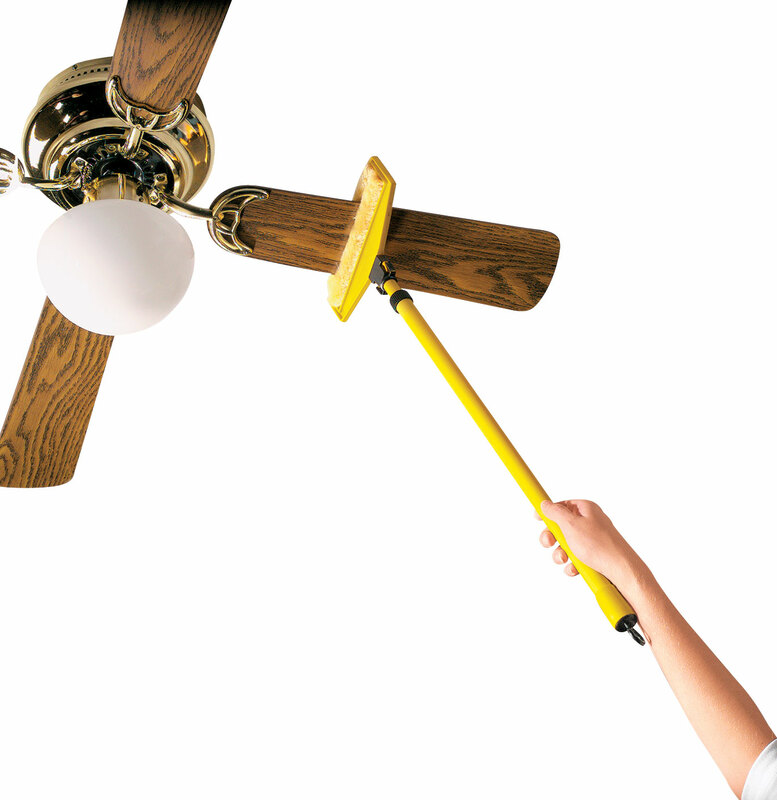 This replacement 360° swivel head attaches right to your clean spin 360 mop system for unparalleled cleaning. 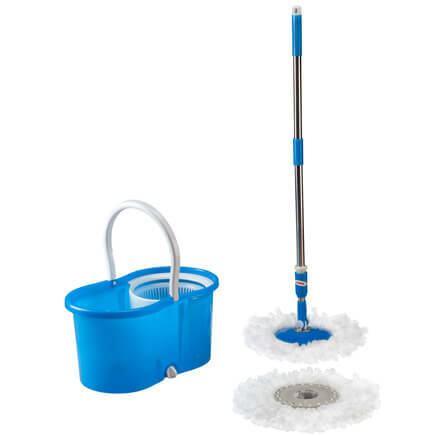 Microfiber mop head is machine washable.